Jayne Sieberry created this gradient song whose refrain is "Don't leave me alone!" Yet we walk with angels, talk with angels, live with angels, but most of the time we are woefully unaware! 1. There is an angelic code: One of the principle responsibilities that angels live by is to be of service to we humans, usually having been invoked, although there are times when angels apply their trade unannounced. 2. Angels have the ability to shape-shift, even appear as one of us, much like in the movie: "It's a Wonderful Life". "I wish to summon a parking place angel who is stable, enthusiastic, powerful, clear, and swift--I need a shaded parking place close to the theater and I will be there in ten minutes--and I THANK YOU!" As I drive up to the theater, a car just backs out of my shaded spot--it's totally Magical! I pull in and again give thanks to my angel! Over the last thirty years I have been successfully using angels, Totem spirits, and Guides to handle all kinds of living situations. It's fun, easy, and reliable. Anyone can do this--all that is required is that we suspend disbelief! Acknowledging they exist is after all the first step in working with angels or any spirit being. Then it is a simple matter of letting them know specifically what you need and thanking them before their help and after. Gratitude is the "payment" we offer them for services rendered. It is important to give thanks just after voicing your request as well as after the task is accomplished. This sets up the energy of belief by showing you know the help will be given as well as creates a reciprocal exchange of energy. Of course with any type of magical practice, the more you put into it, the more you will get back. Start being aware of anything you could ask for that would make your day go smoother and make the commitment to ask for help from an angel at least once a day. Then work your way up to more and more requests. 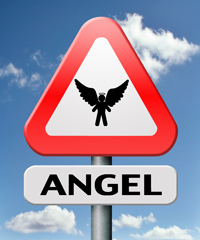 The more you use angels, the more you will start to see all sorts of ways they can help you. Don't think any task is too small or unimportant to "bother" an angel with. I've seen people ask for angelic help with everything from being on time to an important meeting, to helping catch a runaway dog, to how much salt to put on their food. You can learn more about working with angels and other spirit beings in our Learn How to Do Witchcraft Rituals and Spells with Your Bare Hands Kindle book. I will be doing a series of articles: "Touched by an angel"--"The value of a Magical Practice"--"Spellwork, simple, effective and fun"--"The ancient art of Witchcraft in modern times". So stay tuned for those. P.S. : Should there be interest, another topic for investigation will be the Urban Shaman's abilities to make a difference in a troublesome world!